Lexus of Richmond’s week 29 nominee for the Leadership Award Scholarship is Kyle Thielsch of The Math and Science High School at Clover Hill. Having a 4.63 GPA, Kyle scored a 1550 out of a possible 1600 on the SATs and a 35 out of a possible 36 on the ACTs. He received a perfect score of 800 on the SAT Math 2, and he earned 5 perfect scores on his AP tests as well. He is a member of the National Honor Society and is the tutoring coordinator for Clover Hill. Kyle is a part of the National English Honor Society, Mu Alpha Theta, and Tri-M Honor Society. He has been recognized as a National Merit Commended Scholar. Through Clover Hill he has received both the Freshman Math and Science High School Math Award and the Math and Science Excellence Award. A four year Varsity Soccer midfielder for Clover Hill, Kyle was the captain for his final season. As a freshman and a sophomore Kyle was selected for the 2nd Team All Conference. Following his junior year he was named to the 1st Team All Conference as a defender. Kyle played two years of travel soccer for FC Richmond as a defender. Since sophomore year Kyle has taken up dance classes at Marianne Kelley’s School of Dance in order to better his ability to learn choreography and to better his performances for the Clover Hill Show Choir. During his years at Clover Hill, Kyle has participated in several organizations. He is a member of the Student Council Association and the Beta Club. He is the President of the Cavalier Crazies, a student spirit organization. Kyle is a member of the school Show Choir and is currently the dance captain. He additionally has participated in various school musicals. Kyle played Emmett in Legally Blonde, the Beast in Beauty and the Beast, and Schroeder in Charlie Brown: The Musical. Having a passion for soccer, Kyle has volunteered for the Special Olympics annually and U4 Soccer as a freshman and sophomore. As a junior he spent his time as an assistant coach for the Robious Middle School Boys Soccer Team. Through Clover Hill, Kyle volunteered for Stuff the Truck. The students collected supplies to send to victims of the floods in West Virginia in 2016. As a junior and senior, Kyle has been a freshman mentor to assist in the transition into high school, and he is an ambassador for the Math and Science High School at Clover Hill. Kyle has won a dinner for two and is now in the running for the $10,000 scholarship. 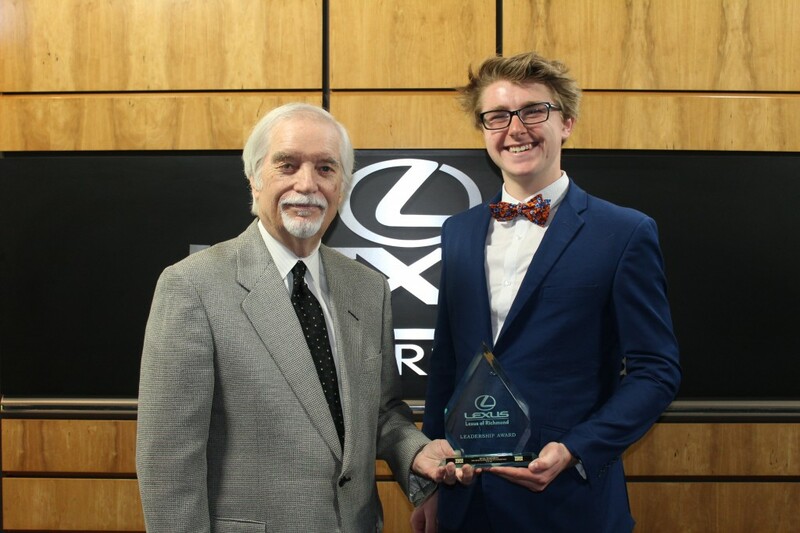 Watch the Fox Richmond – WRLH interview and the Lexus of Richmond Leadership Award interview to learn more about Kyle! Remember to check Facebook for more information about each weekly nominee throughout the school year!